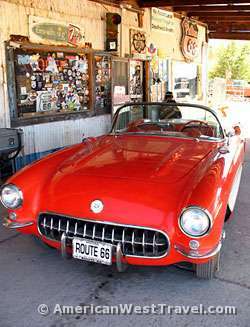 Returning from our recent West Coast road trip, we decided to get some kicks on Historic Route 66 while returning to Phoenix, sampling segments that veered away from Interstate-40 and into a different world. 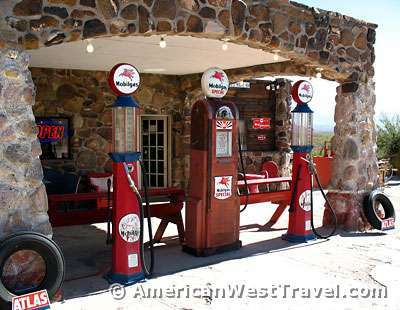 Northwest Arizona features two long segments of Historic Route 66 that veer well away from Interstate-40. 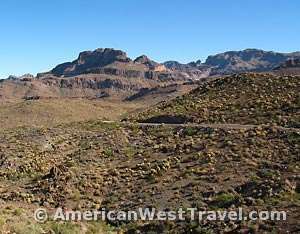 Going west to east, the first is a 53-mile stretch from the Topock exit (mile 1) on I-40 to Kingman, Arizona. 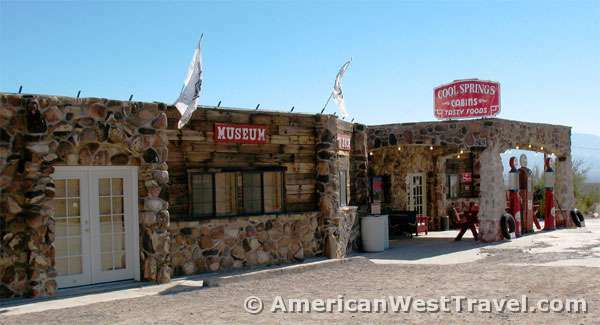 If features beautiful desert mountain scenery and an old west town that refused to die. The second is a roughly 110-mile segment from Kingman to just west of Ash Fork, Arizona. It features a higher elevation with more moderate summer temperatures, access to Grand Canyon attractions, and other cool things. This page covers the Gold Road Mine, Cool Springs, the Hackberry General Store, and the Burma Shave signs. Continuing east from Oatman, the route continues to climb into the mountains, passing right next to the presently operating Gold Road Mine before reaching Sitgreaves Pass at 3,300 feet. Beyond the pass the road starts a quick descent back to the desert with outstanding vistas (photo, above left). You will pass by the remains of Ed’s Camp and Cactus Cafe before reaching Cool Springs Station (photo,above right), which once offered gas, cabins, and food and now is a gift shop and museum (photo, below). The current owner has beautifully restored the ruins of an antique gas station from the glory days of Route 66 to its original condition. The small museum presents memorabilia and some interesting old photos. The current caretaker lives in a trailer out back and loves the isolated lifestyle. East of Cool Springs the road drops back down onto the desert floor and soon intersects Interstate-40 before heading into downtown Kingman. Due to the lateness of the day and the many miles left to drive, we have to bypass Kingman via I-40 and pick up the second large segment of Historic Route 66 just north of town. For all of its Route 66 glitz, Kingman will have to be the subject of its own story at a future date anyway. Beyond Kingman, the route heads north before turning again east, all the while gaining elevation moving from desert to a semiarid grassland. Look for the photogenic remains of the Ranchero Motel (west side of road) at the townsite of Antares. The old, abandoned Ranchero Motel, has also been known as the Kozy Corner Trailer Court. A 14 ft. high giant green head named "Giganticus Headicus" peers at passing motorists from beside of what once was the cafe at the Ranchero Motel. 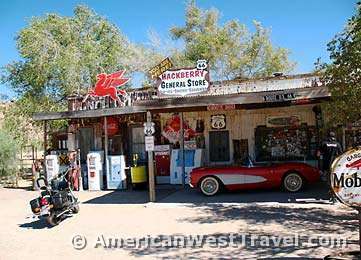 Soon we come to the famous Hackberry General Store, a major Route 66 landmark. The former general store, garage, and gas station is now a souvenir and gift shop, and museum with plenty of memorabilia and knick-knacks. 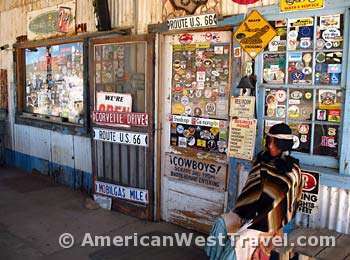 This includes the well-preserved antique gas pumps, the garage and all the old junk, and a number of old cars. The owner is apparently something of an antique car buff. He had a beat up 1948 Buick Eight for sale at $8,500. He had his gorgeous mint condition 1957 red Corvette convertible (photo, right) on display in front. For movie buffs, this was the same kind of car that Otter drove in Animal House (except his was a 1959). 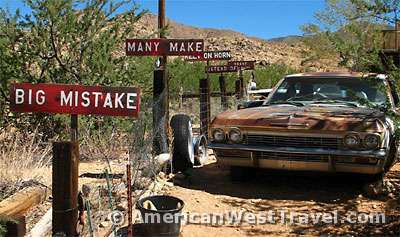 One of the unusual attractions along the Kingman-Seligman segment of Historic Route 66 is the appearance of recreated historic Burma Shave signs at regular intervals. The signs dotted the highways and byways of America from 1925 to 1963, a successful billboard marketing effort during the earlier years of highway travel. A series of six signs were spaced far enough apart to read in a speeding car. Each one had a few words in a witty saying, with the last sign always having the Burma Shave logo (photo, left). All of the adages are documented, and this one originally came out in 1945. All of the Burma Shave sayings can be found at Burma-shave.org. It is quite ironic that during the original era of Burma Shave signs, Arizona was one of four states where the signs were not placed (due to low traffic volume or other issues). We’re making up for it now.